During the system operation, the pressure drop through the filter increases as the element clogs, due to the contaminant retained. The filter element must be replaced when clogged before the pressure drop reaches the bypass valve set value. For this reason it is recommended a clogging indicator on the filter. 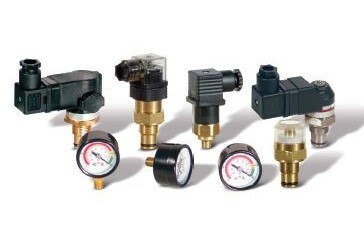 It gives a visual or electrical indication and must have a set value lower than the bypass valve set value, to get an exact indication of the right time for a filter element replacement. On return and low pressure filters the clogging indicator can be a pressure gauge or a pressure switch, measuring the pressure upstream the filter. On some return filters and on high pressure filters, the clogging indicator can be of differential type: measuring the pressure upstream and downstream the filter and activating a signal, when the differential pressure reaches the set value. On suction filters the clogging indicator is a vacuum gauge or a vacuum switch, measuring the de-pressure downstream the filter.